· The Great Depression disaster began in the United States of America, which at the time was the leading economy of the world. 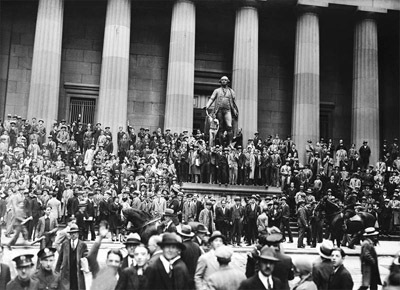 · The event known as “The Wall Street Crash” is also known as the beginning of the Great Depression. 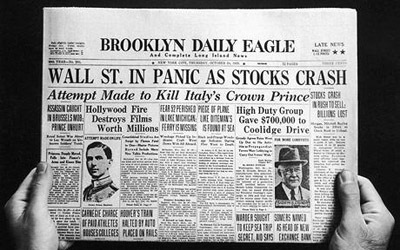 · The exact date of the crash was October 29th 1929, also known as “Black Friday”. · All capitalist economies in the entire world were effected by the Great Depression. · Immediately after the Great Depression hit America, they withdrew the loans they had made to Germany. · German businesses closed, unemployment rose, and inflation was at new heights. · One major factor in the downfall of Germany during the Great Depression was the Treaty of Versailles. · The Treaty of Versailles was put in place to settle outstanding disputes following the end of World War II. Instead of Great Britain, Soviet Union, and France settling their disputes with Germany , who was an Ally, they let their hunger for revenge and their hatred for Germany cloud their views and their better judgment.